This is not an obituary. I am not writing about Hazem Azmi because he died. This is a reading into what someone can achieve as a theatre critic and a scholar when they have faith in change. Hazem Azmi was that someone. For many, Hazem (or Dr. Hazem, as he is known to his students at Ain Shams University) was the ideal teacher of theatre and criticism, as well as a dedicated critic who became known towards the end of the 1990s through his editorial work for the bulletin of the Cairo International Festival for Experimental Theatre. To many, Hazem was also known for his official responsibilities, being a member of the theatre committee at the Supreme Council of Culture, a founding member of the Egyptian Theatre Institute (newly established under the umbrella of UNESCO) and an editor-in-chief of the periodical Theatre(published by the General Book Organisation). And yet, only a very few knew Hazem as a person and in person. I was lucky enough to meet him towards the end of the 1990s at the Hanager Arts Centre. My vague memory tells me that I first saw him in the company of another great and unforgettable Hazem (the very prominent playwright and critic Hazem Shehata). My vague memory also tells me that I had probably seen him before that, at the American University in Cairo, in the company of Professor Walter Eysling who was leading the theatre department at that time. In my eyes, Hazem never changed. He remained the same person over almost 25 years and until 2018. I followed all his writing and he followed all my work. At a certain point I felt that he and I were disciples of the magnificent Nehad Selaiha, each in his/her way. Hazem was not traditional. He was not docile. He was extremely liberal, believed in freedom till the end, and fiercely fought for what he thought was right. He never took sides for any personal benefit, and always talked in honesty and in support of the future. Again, this is not an obituary. His work for the International Federation of Theatre Research as co-convener of the Arabic Theatre Working Group was outstanding. He was among the very few who could bring the realities of Egyptian theatre to the outside world, bridging the gap between international studies and Egyptian theatre, and bringing local works before the eyes of foreign scholars and academia. This task was not at all easy. It invested his skills as a translator, as a critic, as a mediator, as a scholar and, above all, as a nomad. Although Hazem clearly belonged to the academic world more than he belonged to the world of journalistic criticism, he was never defined nor restricted by his academic identity. He went to his lectures, faculty meetings, committees and conferences, in the same way he went to theatre venues and performances. He “visited” all places without dwelling in any. 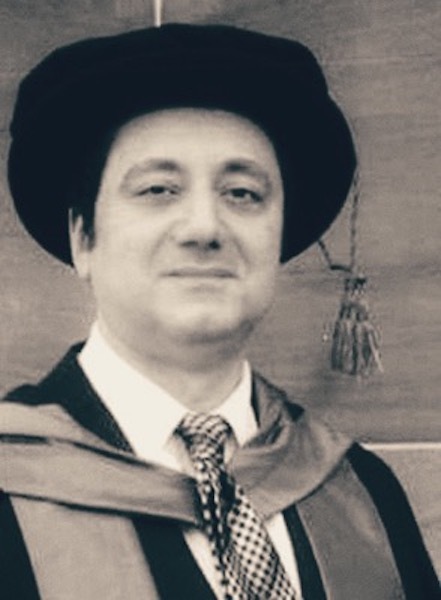 He always carried his journey within him, as if he was internally travelling across all the places he visited, extending his “tour” after Warwick (United Kingdom) where he obtained his PhD. For Hazem, Warwick was not after all an “other” land, it was just a land, and he could belong there and anywhere. After several years in Warwick, Hazem returned to Cairo and joined the theatre department of Ain Shams University. When he returned, the flame of the nomad was very clear in him. After some years, it was still there but almost invisible and struggling to remain. The nomad saw everything with a special eye: the eye of the traveler. He saw theatre and cultural policy through the critical perspective of an entrepreneur who understands how the whole machine works, and how he can contribute to re-inventing it without necessarily becoming part of it. In everything he wrote or taught, he supported the new generation, and understood that the authoritarian machine would be reluctant to make room for those artists and thinkers who deserve to occupy the stage. His support for the progressive and the provocative was not only expressed in written but in spoken form, during long conversations he had with young artists and students. Hazem was convinced he should serve change in every way possible, he was convinced that the human face-to-face talk is necessary to establish a shared understanding and to emphasize the role of human bonding through exchange and solidarity. I cannot help thinking that this exercise of almost friendship and human bonding by personal conversations and encounters is also a trace of Nehad Selaiha, another being that of mobilizing all one’s life for the passion of theatre. Hazem Azmi refused several prestigious official posts. Official public posts were not among his ambitions. He was on a journey that was almost on the far side of power and authority. He was free from the machine, he was the outsider who could change things without being caught within them. I would call him an entrepreneur, one who saw the potential of change and ran in all directions in order to invest and serve that potential. He was an entrepreneur who invested in the new and constructive, as opposed to the politics of hypocrisy and self-interest. In this sense, he was also his-own-kind of pedagogue: a pedagogue who is not only a “teacher” but a mentor, one who defies the hierarchy of knowledge and introduces his students to critical thinking and to democratic learning. Together with his colleagues, he created a forum where he could invite scholars and artists to talk to students and prepare them as future professionals/colleagues. For Hazem, the students were not just “students” but were the potential source of power to change our present. This form of activism within academia and criticism is rare. Hazem was a specialist in interdisciplinary approaches, he brought the perspective of cultural studies to theatre analysis and criticism, and he opened up space in which to understand our performative realities within the intersections of arts-politics-history. In his writings he was also nomadic, jumping from one discipline/perspective to the other, weaving approaches, and painting a full picture of our daily struggles. Those struggles of course also contained an identity crisis for the nomad who belongs everywhere and nowhere at the same time. Nonetheless this identity crisis could always be calmed every time he succeeded in implementing change, and he succeeded several times. Yet the thing that kept him going, even through the darkest times, was his faith that the theatre field in Egypt will flourish anew and young artists will assume their well earned leadership positions. At least two years of our friendship and late-night conversations were dedicated to this dilemma: when/how can the new generation — already ageing quickly — replace the old guard of theatre? when/how can the political dynamics of power and authority be reversed to the benefit of change and justice? The sudden “disappearance” of Hazem Azmi on 10 July 2018 in Belgrade, where he was participating in the conference of the International Federation for Theatre Research, remains a riddle to me. How can such a dreamer and lover of life disappear, proving everything that he wanted to negate? We have no choice but to pursue his dream. Now that he’s gone we no longer have the luxury of pessimism, though it is well to remember that time is not on our side. Nora Amin: Writer, performer, choreographer and theatre director and educator. Fellow of the centre for Theatre of the Oppressed/Rio de Janeiro, 2003. Alumni of the Vilar Institute for Arts Management/The John F. Kennedy for the Performing Arts (USA, 2004), Cultural Leadership in the Performing Arts (British Council, 2009), Clore Leadership diploma (UK, 2009), S. Fischer guest professor at the general and comparative literature institute (FU, 2004-2005), guest lecturer (Acting) at the theatre department of Mount Holyoke College (USA, 2005), Founder of “The National Egyptian Project for Theatre of the Oppressed” and its Arab network (2011 to date), Former fellow of the Academy of the Arts of the World (Cologne, 2015), former fellow of the International Research Centre for Interweaving Performance Cultures (FU, 2015-2016, and 2017: topic “Theatre and Political Transformation”), Valeska-Gert guest professor for dance studies (FU, summer semester 2018: topic “Performing Trauma”).